EdTechnocation: CONTEST! 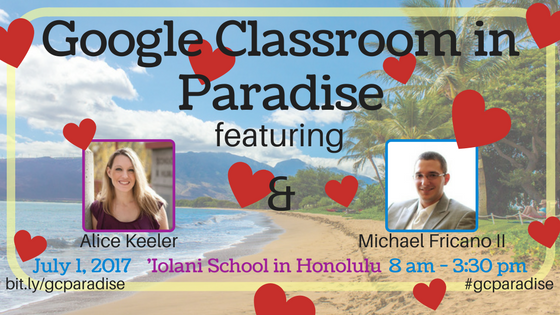 Win Free Registration to Google Classroom in Paradise with Alice Keeler and Michael Fricano II! CONTEST! Win Free Registration to Google Classroom in Paradise with Alice Keeler and Michael Fricano II! Do you love Alice Keeler, the queen of spreadsheets, and her blog and books? Then you'll want to attend Google Classroom in Paradise on July 1st in Honolulu, HI! Here's your chance to earn a free registration! It's almost Valentine's Day! So we're giving away free registration to Google Classroom in Paradise on July 1st (travel and lodging is not included). Fill out the form below to enter. A random drawing will be conducted on February 14, 2017! We're also extending early bird registration through the end of February! So you can still get a ticket for $167!